No special action is required. The driver should honk their horn. The driver should pass the animal as closely as possible. The driver should be very cautious. Be very cautious any time you encounter an animal on the roadway. Pass the animal slowly to avoid startling or frightening it. Approach all tracks with extreme caution and cross only when you know that there is no train coming. Turn your radio down to hear if there may be an approaching train. Only continue once cleared to do so by a flagger, if applicable. You must approach all railroad crossings with extreme caution and cross only when you know that no train is coming from either direction. If there is a flagger at a crossing, you must obey all of their instructions. Drive the speed limit, with caution. Not drive more quickly than 20 mph. You should slow down at the first sign of rain, snow, or sleet, all of which can create slippery road conditions. When conditions on the road are less than ideal, safety may require that you drive more slowly than the posted speed limit. Warning signs prepare drivers for upcoming road conditions and hazards and are usually yellow with black markings. 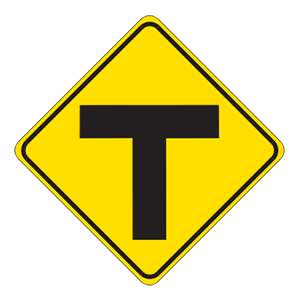 This sign warns drivers that they are approaching a T intersection and should prepare to turn either right or left. Pass the bus before its door opens. When approaching a stopped school bus that is using its stop signal, a driver is required to come to a complete stop. They should not proceed until the stop arm is withdrawn. 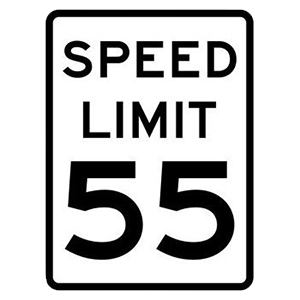 The truck may be traveling at a speed slower than the posted speed limit. You may not be able to safely pass the truck. You may not be able to legally pass the truck. Drivers must be aware that large vehicles often travel at a speed slower than the posted speed limit, especially when driving on an incline, and should use caution when approaching a large vehicle from the rear. When on a hill with limited visibility, it is unlawful to pass another vehicle.